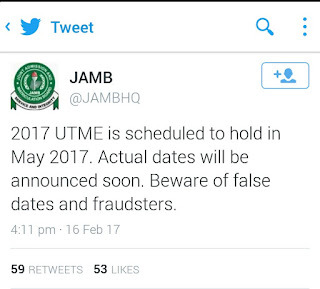 The Joint Admission and Matriculation Board (JAMB) has finally broken the vicious chain of anxiety and pessimism that was binding those who will be sitting for the 2017 Unified Tertiary Matriculation Examination (UTME) by releasing the date for the examination. 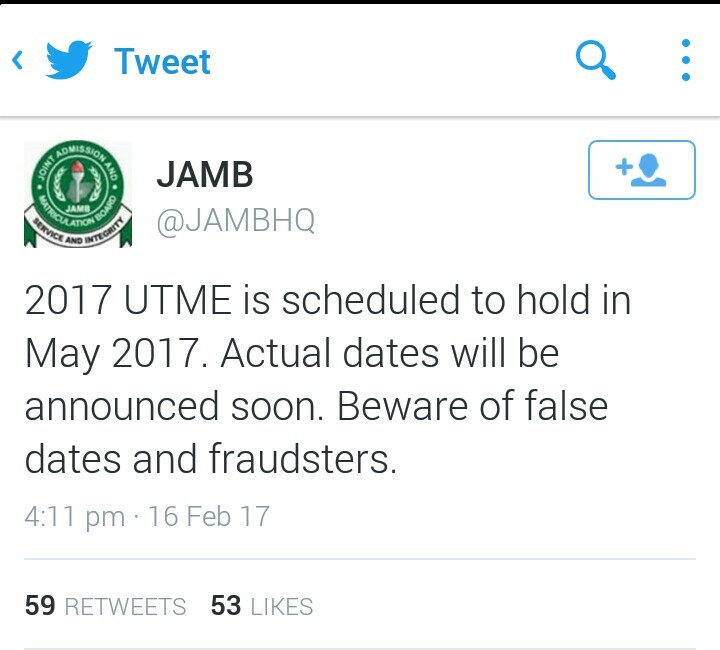 The Examination board, through its twitter handle, has told the general public that the examination will hold across the country in May 2017 and also advised candidate to be careful of false dates and fraudsters. It is important to note that forms are not on sale yet although the date of the examination has been announced. According to the JAMB registrar, Prof Ishaq Oloyede, the reasons for the delay were due to issues the board had with sale of scratch cards and the clash of timetables for which JAMB had met other exam bodies.